Yesterday was a late start, even by our standards, due to us all sleeping in. The cats, who are normally our fuzzy alarm clocks, failed to wake us and so we didn't stumble downstairs until nearly 9am! Fortunately, we had nothing planned so this wasn't a problem, until Dave decided (at 11am) that we should visit Brandon Marsh. With no other fixed ideas for the day, we slowly mustered and off we went. The first inkling we had that an event was on, came as we drove into the car park. Signs indicated the overflow car park was open and as we made our way down the driveway, cars were everywhere. After creeping slowly, carefully around the crowded car park and back up the drive, we duly parked next door as Dave remarked he could hear drumming. 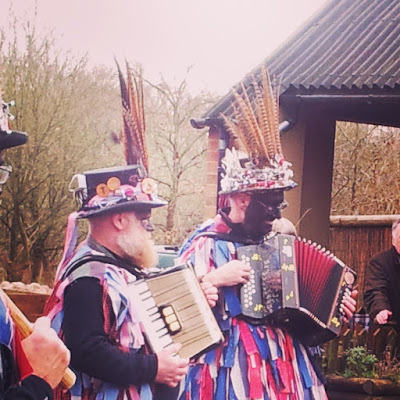 We pondered if there were Morris dancers on site, noting it was late for a Wassail as they normally happen in early January. Once inside, the music, shouting and jingling of bells confirmed that yes indeed, we had accidentally walked in on a Wassail. Naturally, we made the most of it! 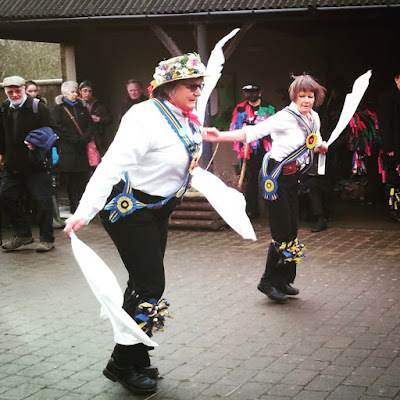 Morris dancing may traditionally be the preserve of men, but these days troupes include women. For the next hour we watched the seven troupes present dance, one after another. Lots of women, including at least two women only troupes. I loved these guys' hats. At the appointed time, i.e. 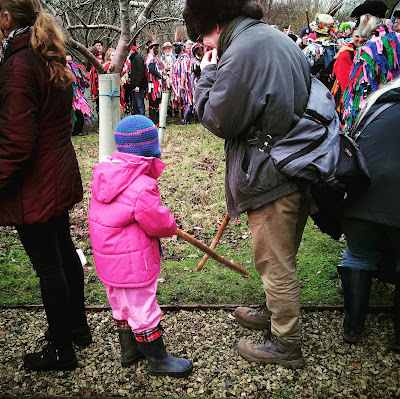 when they had done, we made our way to the orchard to Wassail the trees. This year M decided to join in. M gets to grips with Sticking. Daddy decides to stand back. 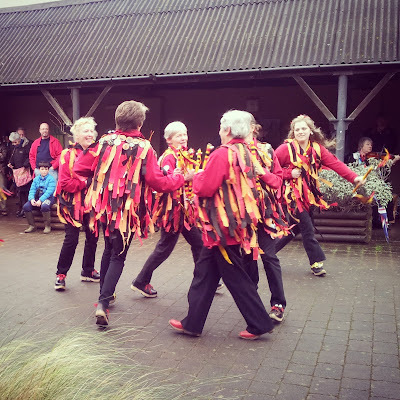 Arming and Siding are familiar dance moves from our regular visits to Mary Arden's Farm. 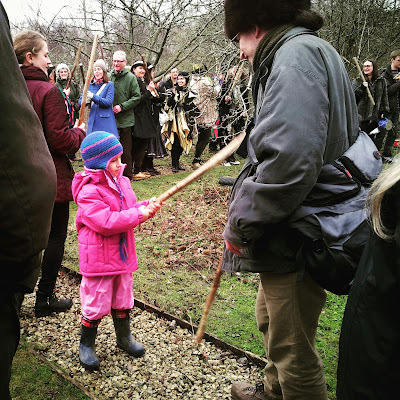 Sticking was a new experience for M. Handing a 5 year old a stick and telling her to whack your stick is not without it's dangers, but Dave managed to avoid injury! We danced, we sang. We dipped toast in cider. 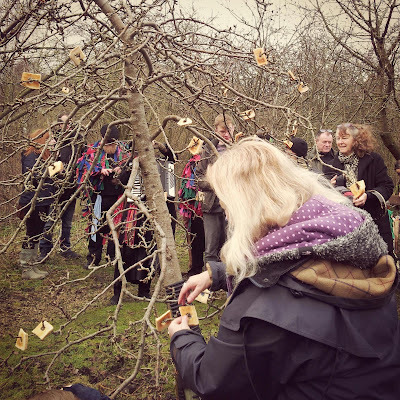 An offering to the apple trees - toast dipped in cider. 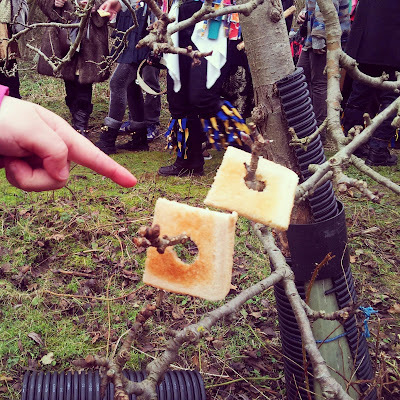 Toast was hung on trees. Lots of toast was hung on trees. Dave and I had an obligatory sip of cider in the trees' honour. One sip was quite enough, raw, proper cider is not to our taste. Festivities over, we continued with our planned walk. Puddles and lots of mud. 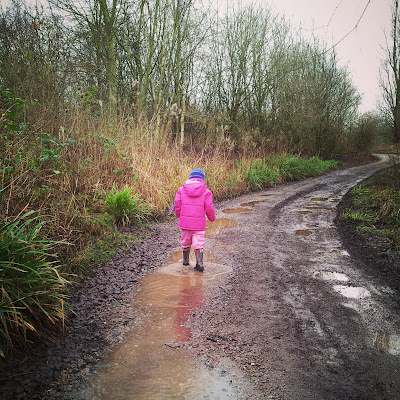 Music, dancing, puddles and mud. A perfect way to spend a grey Sunday.